Can Information Technology Act deal with the dynamics of the Net? THIS is one series of court cases the nation is following keenly. Within one week, in December last year, a criminal and a civil complaint were filed against 20-odd online giants like Google, Facebook, Microsoft and Yahoo for hosting anti-religious and anti-social content on their websites. While the judge hearing the civil case ordered immediate removal and blockade of all controversial content from the web forums named in the plaint, the trial court summoned their top executives for violating the Indian Penal Code (IPC). The companies then approached the Delhi High Court for relief, citing that the matter of hosting objectionable content has been oversimplified and does not address the nuances of the way the Internet works. In high court, website counsels open arguments with the need to protect freedom of expression. They say police investigation report is incomplete and fails to understand the Internet; it does not even mention when, where and by whom the objectionable contents were posted. The websites contest the complaint filed under Section 153-A (promoting enmity between classes), 153-B (assertion prejudicial to national integration) and 295-A (insulting religion or religious belief of any class) of IPC, saying being intermediaries they are immune to legal action under Section 79 of IT Act. The case should have been registered through a process—someone needs to complain against the objectionable content to the web company, who should then be given a chance to do everything possible as listed under the provision of “due diligence” of the IT Rules to remove or explain the content. If the matter is still not removed, the complainant can approach the court, which in turn, needs to go through the Computer Emergency Response Team and inform the web company of the objectionable material. While the appeal has been adjourned till the first week of February, the cases (see ‘Real world v virtual world’ on p10) have once again stirred the debate on the freedom of expression and raised significant doubts over the legal understanding of the virtual world. 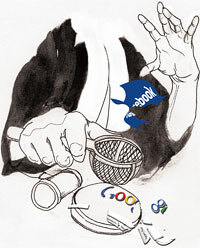 Niraj Kishan Kaul, representing Google in the high court, argued that the trial court issued the summons under IPC when the companies are under the ambit of the Information Technology (IT) Act of 2000. He contended “the summons issued are casual in nature and infringe the Constitutional provisions of freedom of speech”. The IT Act has provisions to deal with objectionable content. Even a web browser can register complaints or take action against objectionable contents, he said. The objectionable content that spurred the civil and criminal cases has, however, taken a backseat for the time being because the hearings were lost in translation of the technicalities of responsibility and liability of hosting objectionable content, laws under which cyber incidents are to be tried and issues of freedom of expression. Legal experts and Internet activists are divided over the efficacy of Indian laws governing the online world. “Is it in tune with the ever-changing technologies of the virtual world?” asks Sidharth Luthra, counsel for Facebook in the high court. Given the limitations, the legal system needs to have an open mind while dealing with the Internet, he adds. Rajeev Dhavan, a senior advocate in the Supreme Court, elaborates: “In the present case, the courts are applying criminal and company laws to the Internet Service Providers (ISPs). Under company law, the director is held liable for the actions of the company. How can the same logic be used in a forum where the content is published without the knowledge of an ISP?” This, he says, is akin to blaming a phone manufacturer for the use of his phone by a criminal. Pranesh Prakash of the Centre for Internet and Society (CIS), a non-profit in Bengaluru, agrees. He says the Internet needs regulation but it cannot be treated as a gigantic newspaper or media channel. Besides, the IT Act provides for protection of intermediaries; web browsers, social networking sites and websites cannot be held responsible for material published on their forums by a third party. But the IT rules introduced in April 2011 severely watered down this protection, Prakash adds. Internet activists and legal experts have been criticising the IT rules since their introduction, saying they are at cross purposes with the IT Act. “The rules were meant to lay down the process through which complaints should be made and define certain terms used in the Act,” says Apar Gupta, an IT law expert and advocate at the high court. Instead, they only fleshed out the mechanism for censorship and contain vague words that do not have reference to any existing provisions of the law. For instance, the rules use terms like “blasphemous”, “grossly harmful material” and “any material harmful to minors” to define objectionable material. But India has no law on blasphemy, nor is there any Act that defines grossly harmful material or what ought to be the punishment for uploading or downloading such material, Gupta explains. Pavan Duggal, cyber law expert and a Supreme Court advocate, says the IT laws lack parameters for effective implementation. Since 1995, when the Internet was officially introduced in the country, till date, there have been only three convictions under the laws dealing with cyber crime and the highest fine ever levied was Rs 12 lakh. People’s trust in the efficacy of legislation is eroding, he says, adding that there is need for a stronger law dealing with all the nuances of the virtual world. The cases underscore the global concern over attempts by governments to curb freedom of expression and control a decentralised mechanism of information dissemination—the latest being the proposed anti-piracy laws in the US— primarily for two reasons. One, the complaints against the web companies came close on the heels of a public remark by Union Minister of Communications and IT Kapil Sibal on censorship and pre-screening of web content. Two, Judge Suresh Kait, after adjourning the Google and Facebook appeal hearing in the high court, had remarked that the ISPs need to find censoring mechanisms to avoid objectionable content. He said the companies could be blocked as has been done in China if they failed to comply with Indian laws. Though the comments were not made on record they caused uproar in the media and among supporters of Internet freedom. “The case deals with technical aspects of our Internet laws but the judges’ remarks and observations, in both the trial court and the high court, raise concerns of censorship and freedom of expression,” says Parasanth Sugathan, lawyer with the Software Freedom Law Centre, international lawyers’ network. Nishant Shah of non-profit CIS says, “So far, in liberal democracies like India and the US, information was taken for granted and not perceived as central to the understanding of society.” Today, governments are taking cognisance of living in an informed society, which is leading to legal battles between those giving information and those trying to regulate it, Shah adds. Good article threading through the developments and a great introduction to the problems. Thank you! But let me disagree with Pavan Duggal here on his call for "strengthening" the IT Act for it to be "more effective". The IT Act is more abused than ineffective. The abuses have caused more real harm in magnitude (and with societal implications) than any offsetting salutary effects from the few convictions he mentions (assuming they all upheld justice. Did they? No research). The thing not to forget is that, with all criminal process, the process itself is punishment. Doubly so when it is abused. And the IT Act is so open to abuse and has been more abused than used correctly (not hearsay, I have unearthed quite a few documented reports on this). Since there is hardly any awareness or protest against the IT Act's fuzzy and dangerous provisions, Nitin Shah's on-the-fly comment admitting India into the same club as USA ("in liberal democracies like India and the US") is hardly deserved. Where is the liberal mind in India ? And even if there are, are there enough of those minds to form a democracy ? However, India does have a "marketplace for outrage" that is so mainstream -- which again works counter to anything liberal. The ill effects of the IT Act are already at work. According to another online author, it is making the Indian Netizen guilty until proven innocent. Perhaps Section 66A is best scrapped; no harm would be done by doing so. Cr.PC sections 499 and 500 are already well established and sufficient to deal with any damage to reputation, irrespective of the medium of expression. Indeed, cases like eSys (Chandigarh Police Cyber Crime Cell), Jay Polychem (Punjab Police) and Global Indian International School (Mumbai Police Cyber Crime Cell) are examples of private companies exploiting the ill-conceived sections of the IT Act to target whistleblowers, former employees and so on with assistance from the police. This is definitely not the stated intent of the IT Act. In cases like the Global Indian International School--http://janamejayan.wordpress.com/2012/11/01/one-more-case-of-misuse-of-section-66-a-of-it-act/--we surmise that the IT Act has been used for its power to wreak damage, instead of the most appropriate Sections 499/500. Sections 499/500 would probably rule right away that there was no intent to damage reputation, and uphold the right to offer scathing criticism and commentary: a more natural and just outcome. It is little wonder then that Freedom HouseÃ”Ã‡Ã–s Ã”Ã‡Ã¿Freedom on the Net 2012Ã”Ã‡â–“ survey has placed India in the Ã”Ã‡Ã¿partly freeÃ”Ã‡Ã– category and ranked it below Libya and Turkey.